The contractor who installed these double French doors leading to the patio did an awful job installing the simple door trim around it. The fit and finish of the trim was the worst I’d ever seen in my life. So I had to do something about it. These doors lead to the lush, flowery shaded patio, and deserved far better moldings to mark the transition. The resulting door surround is DOOR TRIM-133. It was such an easy style to install that I didn’t bother taking installation pictures of it. In the near future I’ll have to build another one so I can show those of you who are new to decorating with moldings all the steps. Those of you more experienced will look at this and go, pssth, piece-of-cake. Below The gap in that miter joint is big enough to throw a cat through it. This blog does not in any way endorse the practice of cat-throwing, however poking them to make them yap in indignation is encouraged. Beautiful double French doors deserve better moldings that this starter trim. A simple yet grand Victorian entablature. Below At what point in your growth as a craftsman — let alone a businessman — does the below carnage become acceptable? This should serve as a warning to those of you who are going to hire a finish carpenter to install your moldings — not all finish carpenters have the standards of finish. There, that should do it. All the painters need to do now is add a case of caulk and it will look perfect! A simple Victorian Style plinth block available at your local lumber yard. There’s a whole set of diy installation instructions at DOOR TRIM-133 if you need some tips on how to build this door trim pattern at home. Hey this looks fantastic – I just finished a set of french doors for a closet very similar to this, but I’m not using any plinth blocks at the base of the casing. Instead I used a hand-made fir backband that’s 1 1/8″ thick to run the baseboard against because it matches the rest of the house. In general what do you think about skipping the idea of using a plinth block at the base of your casing? Also, since I’m doing this for a closet I was wondering what to do on the INSIDE of the closet. I don’t want to be this elaborate and am looking for something simple to finish it off in there. 1. I’ve seen door surrounds like this without plinth blocks in historic homes, so you’re OK there. 2. Your backband. I’m not clear if you meant that you’re going to run that on the door surround pilaster or if you meant for the baseboard. If for your pilaster, that would not would be a proper use for a backband. 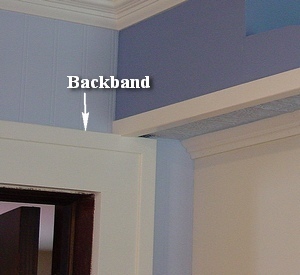 A backband is used to go all the way around door casings (or architrave) but not up the side of pilasters. Is your current backband like the one in this picture? 3. The inside of the closet can either be flat-stock casing or the same as what you have as your subordinate door trim in the rest of the house. It would help a bunch if you could email me a few pictures so I can see what you’ve already got. Contact Ken here.